How human language evolved from the need for social communication The origins of human language remain hotly debated. Despite growing appreciation of cognitive and neural continuity between humans and other animals, an evolutionary account of human language--in its modern form--remains as elusive as ever. The Social Origins of Language provides a novel perspective on this question and charts a new path toward its resolution. In the lead essay, Robert Seyfarth and Dorothy Cheney draw on their decades-long pioneering research on monkeys and baboons in the wild to show how primates use vocalizations to modulate social dynamics. 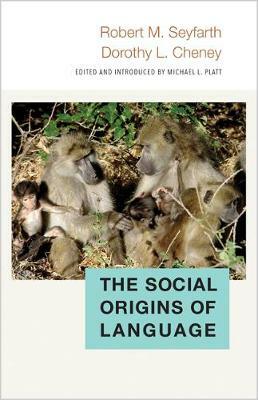 They argue that key elements of human language emerged from the need to decipher and encode complex social interactions. In other words, social communication is the biological foundation upon which evolution built more complex language. Seyfarth and Cheney's argument serves as a jumping-off point for responses by John McWhorter, Ljiljana Progovac, Jennifer E. Arnold, Christopher I. Petkov and Benjamin Wilson, and Peter Godfrey-Smith, each of whom draw on their respective expertise in linguistics, neuroscience, philosophy, and psychology. Michael Platt provides an introduction, Seyfarth and Cheney a concluding essay. Ultimately, The Social Origins of Language offers thought-provoking viewpoints on how human language evolved.